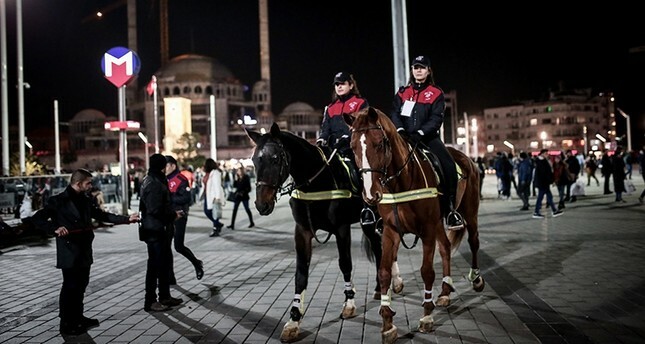 For the first year ever, mounted police are ensuring revelers in Istanbul's Taksim Square stay safe during the festivities. Taksim Square, which marks the heart of Istanbul, is a main gathering place for those looking to welcome in the New Year with their fellow Istanbulites. However, the square is also the focus of heavy security measures, with a New Year's Eve terrorist attack on Istanbul's Reina nightclub just three years ago fresh in memory. In line with security measures taken by Istanbul Police Department, all roads leading to Taksim Square and Istiklal Street have been closed to traffic. Police and special operations teams have been deployed in the area, some using drones to patrol for suspicious or unruly activity. Along with horses partnering with law enforcement officials, some police are accompanied by indigenous Turkish Kangal and Akbaş dogs, as well. Fire brigades are also stationed in Taksim and the surrounding areas in case of emergency. Last year, authorities banned large-scale outdoor celebrations in popular spots including Taksim Square, Şişli and Beşiktaş on New Year's Eve for security reasons. Tuesday marks the second anniversary of an attack by a Daesh gunman who mowed down 39 revelers in Reina nightclub in Ortaköy. The Daesh militant who carried out attacks had scouted Taksim Square for the attack before changing his location to the popular nightclub.